Solid soap is handmade with the trademark "SIBERINA" range: "Pine", "Honey", "rose", "Sea", "herbs", "sea-Buckthorn", "scrub Soap", "Charcoal detox", "black clay", "white clay" and "Castilian", "Tar", "Mint", "Hypoallergenic", "Eucalyptus", "home" brand "SIBERINA" The products are manufactured according to CU TR 009/2011 "On safety of perfumery and cosmetic products". GOST 28546-2002 "Soap solid. General specifications" Code TN VED TS 3401 11 000 1 serial output Conforms to the requirements of TR CU 009/2011 "On safety of perfumery and cosmetic products". Storage conditions and shelf life of products installed in accordance with the requirements of TR CU 009/2011 "On safety of perfumery and cosmetic products" and specified in the annexed product shipping documentation and/or on the packaging of each product unit. Shelf life 2 years. Storage conditions not lower than +5C and not higher than +25C. Shelf life and storage conditions indicated on the packaging. Cosmetic means for care of hair: natural balm for hair with the trademark "SIBERINA": "For dry hair", "For oily hair", "For normal hair", "dandruff", "hair growth", "hair volume", "Restoring", "Hypoallergenic", "tar", "Firming", "Anti hair loss", "Vitamin", "For Shine and smoothness of hair", "For blonde hair", "hair", "Against the gray", "Cooling. The products are manufactured in accordance with GOST 31460-2012 "oils. 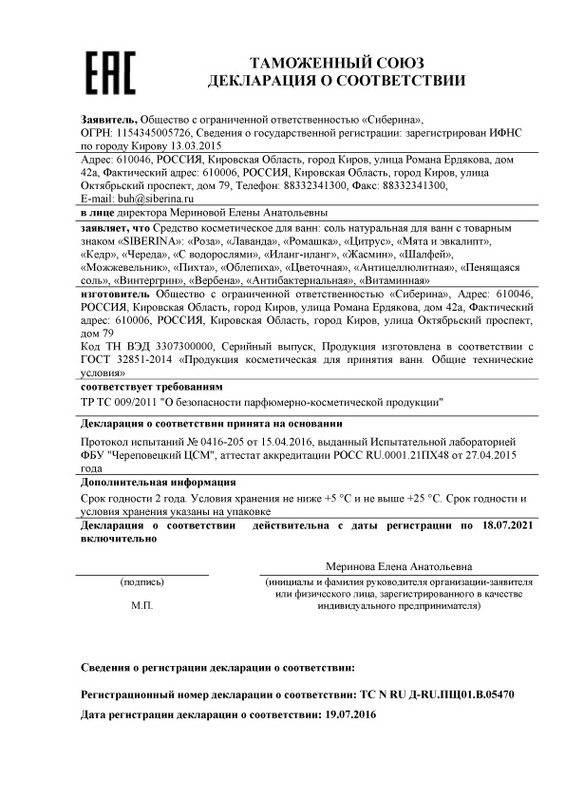 General technical conditions" meets the requirements TR CU 009/2011 "On safety of perfumery and cosmetic products". Shelf life 2 years. The conditions of storage not below +5 C and above +25 C. shelf Life and storage conditions indicated on the packaging. Cosmetic clay, packaged under the trademark "SIBERINA" in the range: White, pink, yellow, green, red, blue, black. 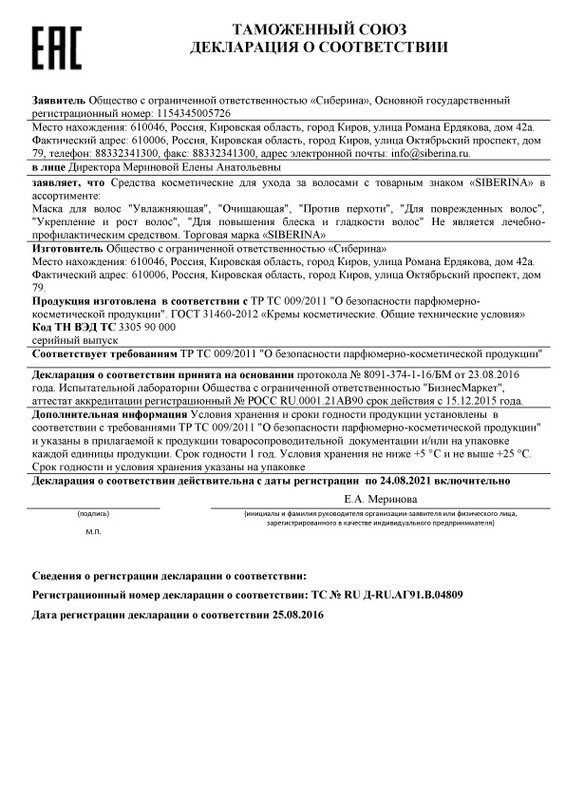 Trademark "SIBERINA" Meets the requirements of TR CU 009/2011 "On safety of perfumery and cosmetic products" The Declaration of compliance adopted on the basis of Protocol No. 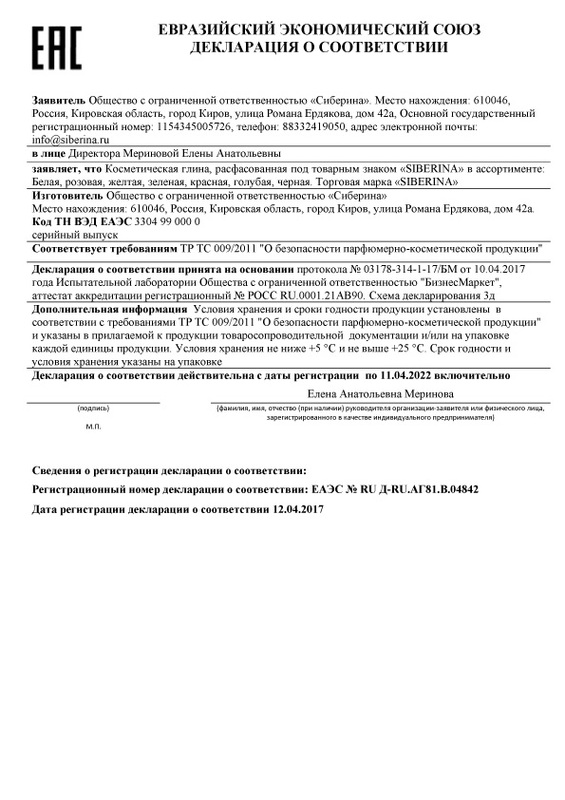 03178-314-1-17/BM from 10.04.2017 of the year Testing laboratory of limited liability company "Biznesmarket", accreditation certificate, registration number ROSS RU.0001.21AB90. 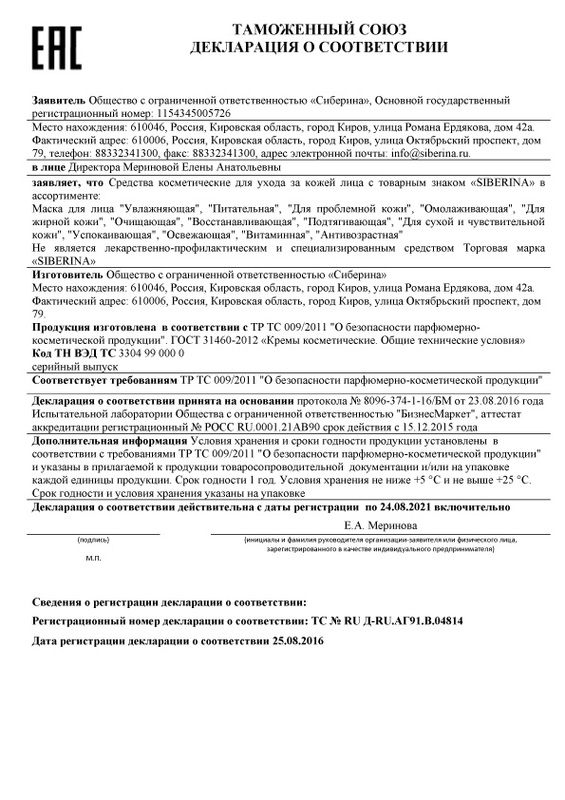 The scheme of the Declaration 3D Additional information storage Conditions and the shelf life of products installed in accordance with the requirements of TR CU 009/2011 "On safety of perfumery and cosmetic products" and specified in the annexed product shipping documentation and/or on the packaging of each product unit. Storage conditions not lower than +5C and not higher than +25C. Shelf life and storage conditions indicated on the packaging. Tools cosmetic used after shaving with the trademark "SIBERINA" in the range: After shave balm "For sensitive skin", "Cooling", "Moisturizing" brand "SIBERINA" The manufacturer-limited liability company "Siberia" Location: 610046, Russia, Kirov region, Kirov, street of the Novel Erdakova, house 42A. Actual address: 610006, Russia, Kirov region, Kirov, street the October prospectus, home 79. The products are manufactured according to CU TR 009/2011 "On safety of perfumery and cosmetic products". GOST 31460-2012 "oils. General specifications" Code TN VED TS 3307 10 000 0 serial production Meets the requirements of TR CU 009/2011 "On safety of perfumery and cosmetic products"
Cosmetic means for skin care of the body with the trademark "SIBERINA" range: Solid body cream - a massage bar, "Coconut", "Raspberry", "Chocolate", "olive", "Shea (Shea)", "Citrus", "Chamomile", "Lavender", "ylang-Ylang", "Neroli", "Jasmine", "Mint", "white clay", "With blue clay", "Cellulite". Is not treatment-and-prophylactic and specialized means. Trademark "SIBERINA" The products are manufactured in accordance with GOST 31460-2012 "oils. 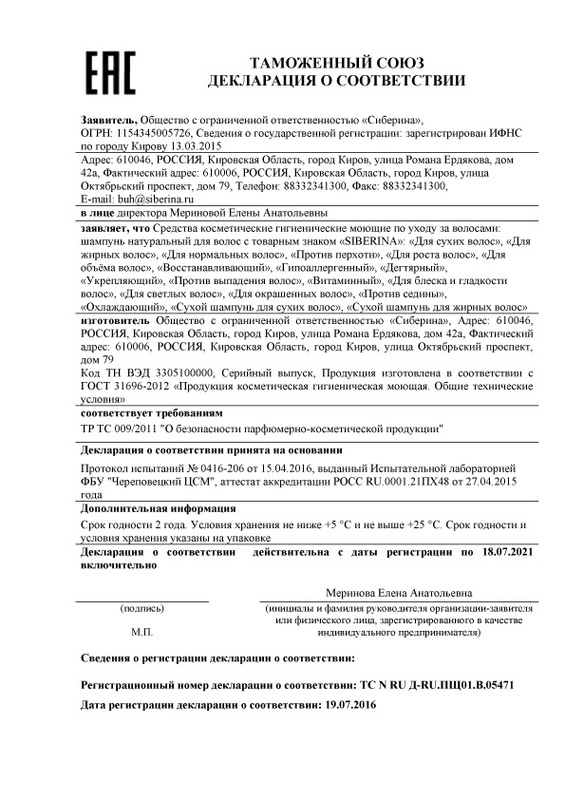 General technical conditions" Meets the requirements of TR CU 009/2011 "On safety of perfumery and cosmetic products". Storage conditions and shelf life of products installed in accordance with the requirements of TR CU 009/2011 "On safety of perfumery and cosmetic products" and specified in the annexed product shipping documentation and/or packaging each unit of production. Shelf life 1 year. Storage conditions not lower than +5C and not higher than +25C. Tools cosmetic hygienic cleaning for hair care: shampoo natural hair with the trademark "SIBERINA": "For dry hair", "For oily hair", "For normal hair", "dandruff", "hair growth", "hair volume", "Restoring", "Hypoallergenic", "tar", "Firming", "Anti hair loss", "Vitamin", "For Shine and smoothness of hair", "For blonde hair", "hair", "Against the gray", "Cooling", "Dry shampoo for dry hair", "Dry shampoo for oily hair" The products are manufactured in accordance with GOST 31696-2012 "cosmetic Products hygienic cleaning. 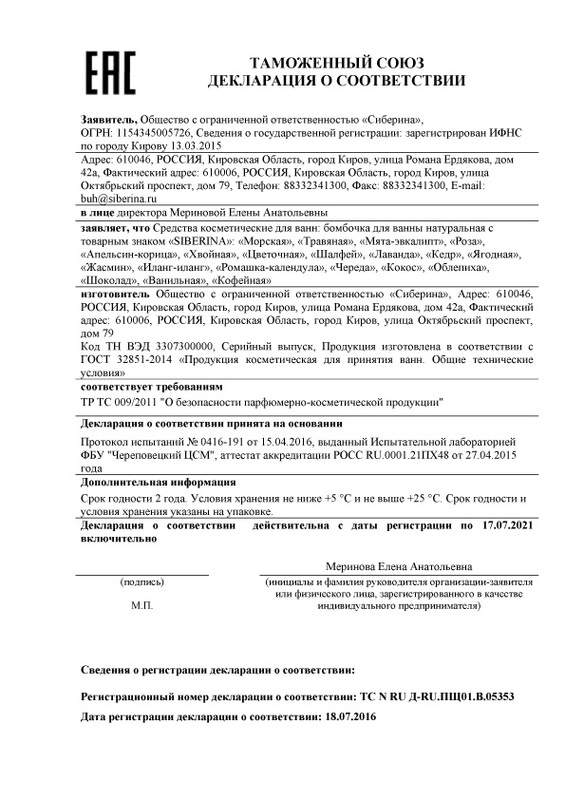 General technical conditions" meets the requirements of TR CU 009/2011 "On safety of perfumery and cosmetic products" Declaration of conformity was adopted on the basis of Test report number 0416-206 from 15.04.2016 issued by a Testing laboratory FBU "UCM Cherepovets", accreditation certificate ROSS RU.0001.21PX48 from 27.04.2015. Shelf life 2 years. The conditions of storage not below +5 C and above +25 C. shelf Life and storage conditions indicated on the packaging. Cosmetic means for skin care with trademark "SIBERINA" in the range: Cream "Moisturizing day", "night Moisturising", "Nourishing for dry skin, evens the complexion", "daytime anti-Aging", "anti Aging night", "For oily skin", "eyeshadow". Creams for hands, "Hydration and recovery", "Nourishing for dry skin", "anti-aging". Creams for the feet "From fatigue", "Deodorizing", "Food and hydration". Creams for the body "anti-Cellulite", "Hydration and nutrition", "Smoothing", "nutritious Hypoallergenic", "Allergy-free for sensitive skin", "Hypoallergenic moisturizer". 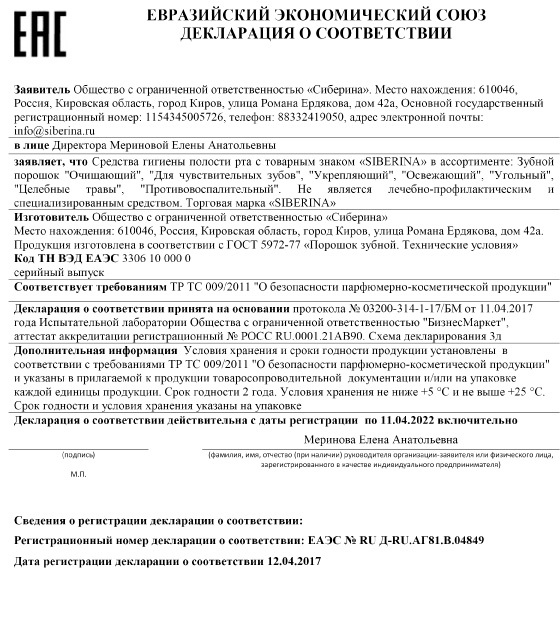 Is not treatment-and-prophylactic and specialized means the trademark "SIBERINA" The products are manufactured according to CU TR 009/2011 "On safety of perfumery and cosmetic products". GOST 31460-2012 "oils. 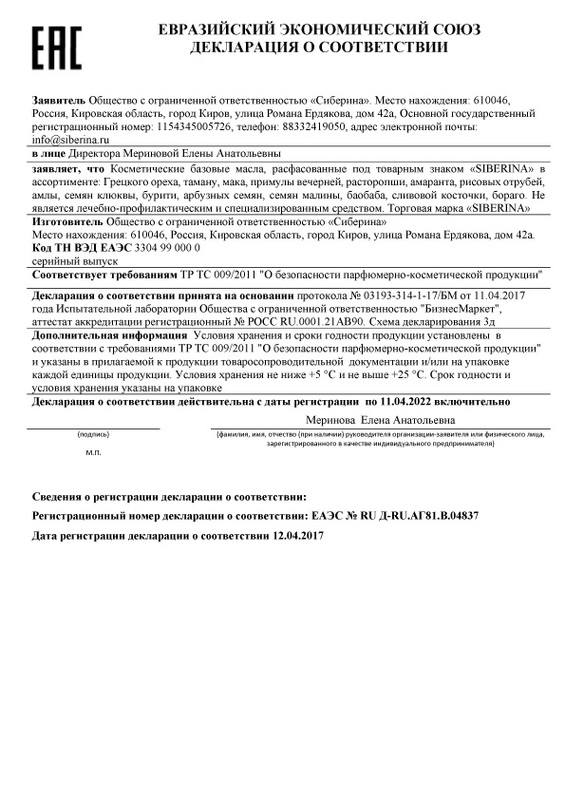 General technical conditions".Shelf life 1 year. The conditions of storage not below +5C and above +25C. shelf Life and storage conditions indicated on the packaging. Means for washing the skin, in the form of liquid or cream. Tools cosmetic hygienic cleaning: shower gel natural with the trademark "SIBERINA": "Herbal", "Pine", "Juniper", "Forest", "Berry", "Sea", "sea-Buckthorn", "Grapefruit", "rose", "Jasmine", "Hypoallergenic","Lavender", "Sage", "tar", "Floral", "Rosemary", "Peppermint and eucalyptus","Antibacterial", "Coffee", "Vitamin". The products are manufactured in accordance with GOST 31696-2012 "cosmetic Products hygienic cleaning. 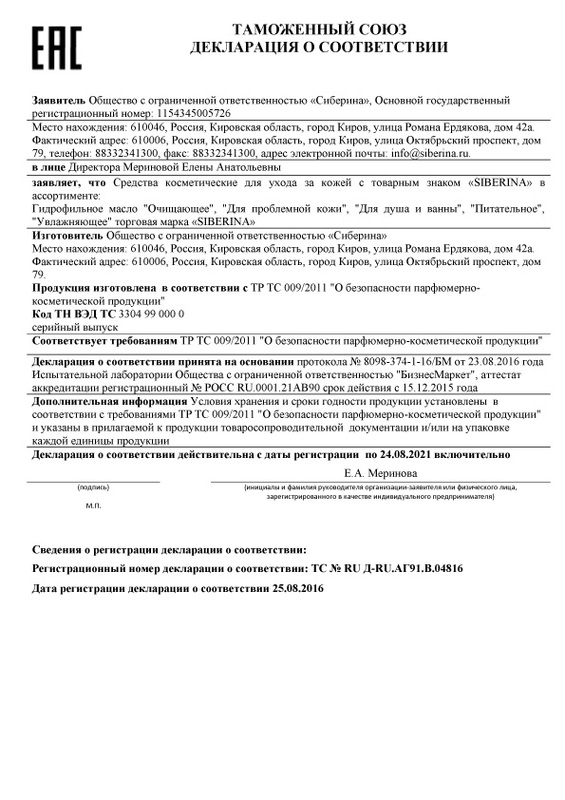 General technical conditions" meets the requirements of TR CU 009/2011 "On safety of perfumery and cosmetic products" The Declaration of compliance adopted on the basis of test report No. 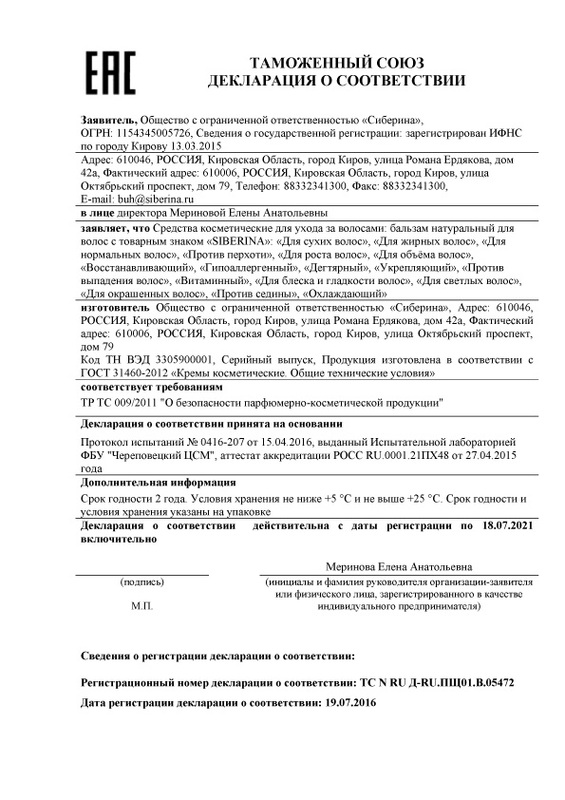 0416-203 from 15.04.2016 issued by a Testing laboratory FBU "UCM Cherepovets", accreditation certificate ROSS RU.0001.21PX48 from 27.04.2015. Shelf life 2 years. The conditions of storage not below +5 C and above +25 C. shelf Life and storage conditions indicated on the packaging. Tool beauty bath salt, natural bath towarzyszaca "SIBERINA": "rose", "Lavender", "Daisy", "Citrus", "Peppermint and eucalyptus", "Cedar", "Chain", "algae", "ylang-Ylang", "Jasmine", "Sage", "The juniper tree", "Fir", "sea-Buckthorn", "Floral", "Wheat", "Foaming salt", "Wintergreen", "Verbena", "Antibacterial", "Vitamin" The products are manufactured in accordance with GOST 32851-2014 "cosmetic Products for bathing. 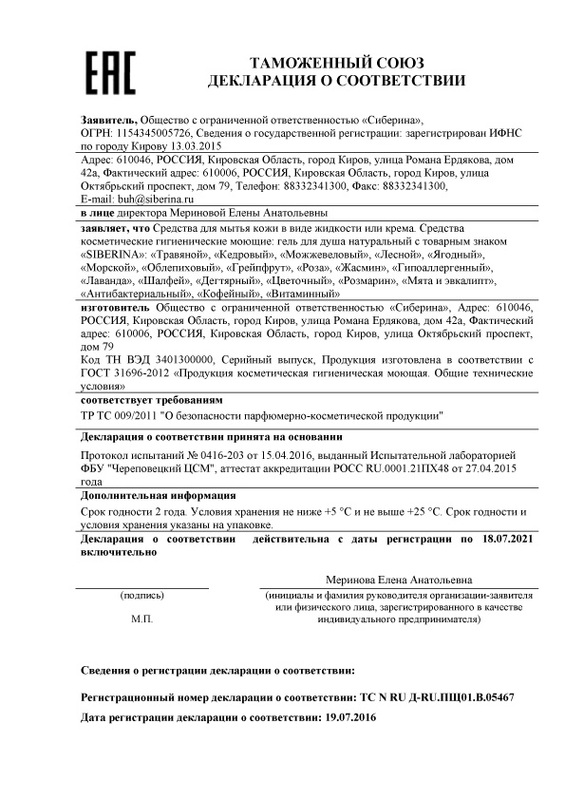 General technical conditions" meets the requirements of TR CU 009/2011 "On safety of perfumery and cosmetic products". 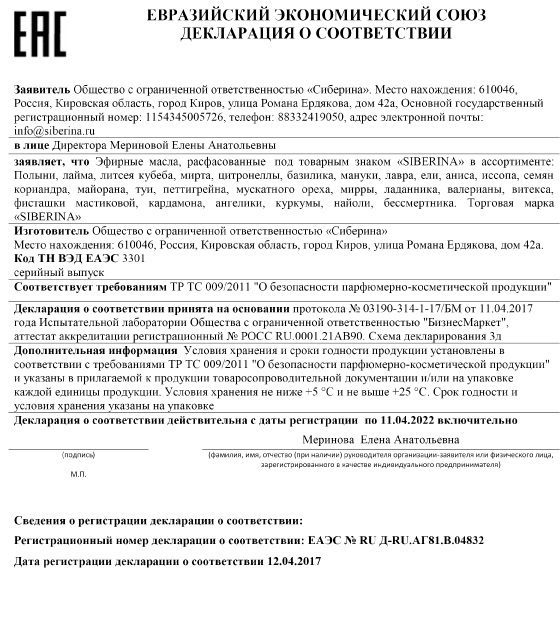 The Declaration of compliance adopted on the basis of test report No. 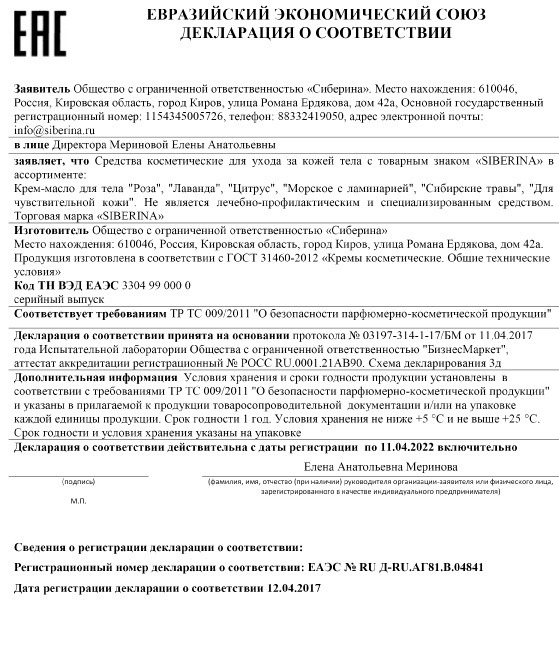 0416-205 from 15.04.2016 issued by a Testing laboratory FBU "UCM Cherepovets", accreditation certificate ROSS RU.0001.21PX48 from 27.04.2015 Shelf life 2 years. The conditions of storage not below +5 C and above +25 C. shelf Life and storage conditions indicated on the packaging. Cosmetic means for skin care of the face with the trademark "SIBERINA" in the range: facial cleanser "Cleanser", "anti-Inflammatory", "For sensitive skin", "Moisturizing", "Refreshing", "For dry and normal skin" "For oily skin" is Not treatment-and-prophylactic and specialized equipment brand "SIBERINA" The products are manufactured according to CU TR 009/2011 "On safety of perfumery and cosmetic products". GOST 31460-2012 "oils. General specifications" Code TN VED TS 3304 99 000 0 the serial production Meets the requirements of TR CU 009/2011 "On safety of perfumery and cosmetic products" Storage conditions and shelf life of products installed in accordance with the requirements of TR CU 009/2011 "On safety of perfumery and cosmetic products" and specified in the annexed product shipping documentation and/or on the packaging of each product unit. Shelf life 1 year. The conditions of storage not below +5 C and above +25 C.
Cosmetic means for skin care of the face with the trademark "SIBERINA" range: face Mask "Hydrating", "Nourishing", "For sensitive skin", "anti-aging", "For oily skin", "Cleansing", "Healing", "Pullup", "For sensitive skin", "Soothing", "Refreshing", "Vitamin", "Anti-aging" is Not a medicinal-and-prophylactic and specialized means the trademark "SIBERINA" the Products are manufactured according to CU TR 009/2011 "On safety of perfumery and cosmetic products". GOST 31460-2012 "oils. General specifications" Code TN VED TS 3304 99 000 0 the serial production Meets the requirements of TR CU 009/2011 "On safety of perfumery and cosmetic products" the storage Conditions and the shelf life of products installed in accordance with the requirements of TR CU 009/2011 "On safety of perfumery and cosmetic products" and specified in the annexed product shipping documentation and/or on the packaging of each product unit. Shelf life 1 year. Storage conditions not lower than +5C and not higher than +25C. Cosmetic base oil, packaged under the trademark "SIBERINA" in the range: Pine, Shea (Shea), Laurel, coconut, argan, cumin, apricot kernel, rosehip, sea buckthorn, peach, cottonseed, grapeseed, avocado, almond, sesame, jojoba, wheat germ, aloe Vera butter, babassu, black currant, pumpkin, cocoa, macadamia, hazelnut, broccoli, hemp, mango, neem, olive, burdock, castor. 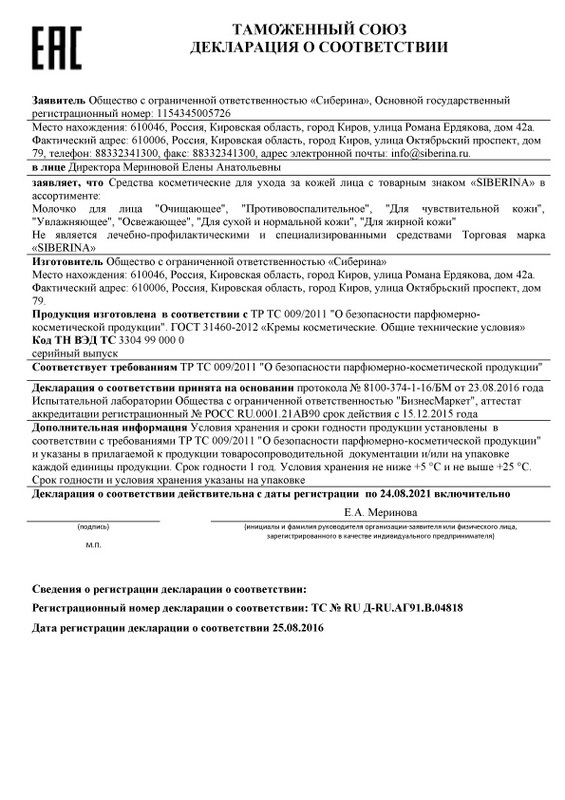 Is not treatment-and-prophylactic and specialized means the trademark "SIBERINA" The products are manufactured according to CU TR 009/2011 "On safety of perfumery and cosmetic products". Meets the requirements of TR CU 009/2011 "On safety of perfumery and cosmetic products". Storage conditions and shelf life of products installed in accordance with the requirements of TR CU 009/2011 "On safety of perfumery and cosmetic products" and specified in the annexed product shipping documentation and/or on the packaging of each product unit. Storage conditions not lower than +5C and not higher than +25C. Tools beauty bath: bath bomb natural the trademark "SIBERINA": "Sea", "Herbal", "Mint-eucalyptus", "rose","Orange-cinnamon", "Coniferous", "Floral", "Sage", "Lavender", "Cedar", "Berry","Jasmine", "ylang-Ylang", "Chamomile-calendula", "Series", "Coconut", "sea-Buckthorn","Chocolate", "Vanilla", "Coffee" The products are manufactured in accordance with GOST 32851-2014 "cosmetic Products for bathing. 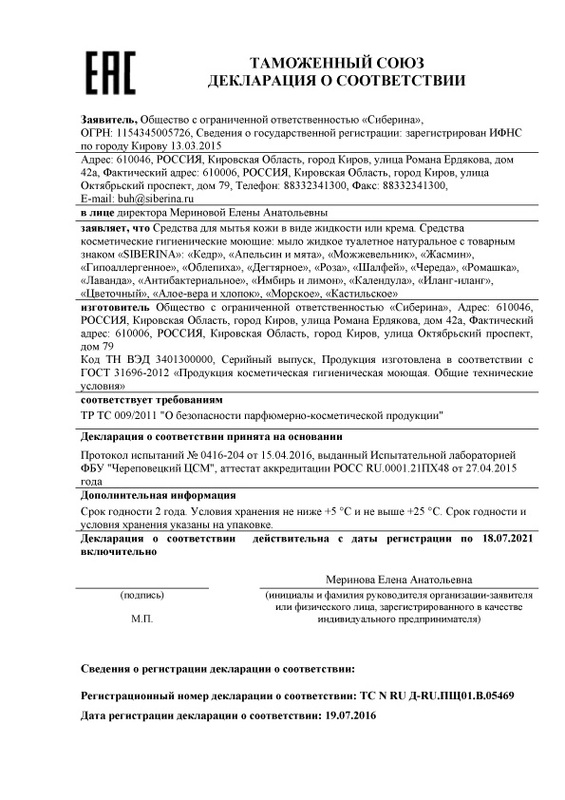 General technical conditions" meets the requirements of TR CU 009/2011 "On safety of perfumery and cosmetic products" The Declaration of compliance adopted on the basis of test report No. 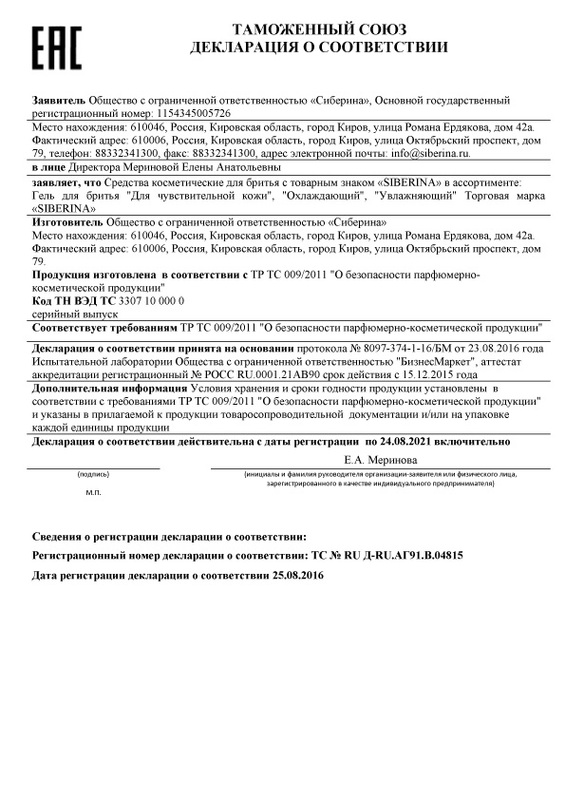 0416-191 from 15.04.2016 issued by a Testing laboratory FBU "UCM Cherepovets", accreditation certificate ROSS RU.0001.21PX48 from 27.04.2015. Shelf life 2 years. The conditions of storage not below +5 C and above +25 C. shelf Life and storage conditions indicated on the packaging. Cosmetic means for care of lip skin with a trademark "SIBERINA" range: lip Balm "Aloe cotton", "panthenol", "Mint", "Berry", "Orange-cinnamon", "Chocolate", "Cedar", "sea-Buckthorn", "Healing", "Nutrition", "Hypoallergenic", "Coconut", "Oatmeal", "Shi and babassu", "Almond". Trademark "SIBERINA" The products are manufactured according to CU TR 009/2011 "On safety of perfumery and cosmetic products". GOST 31460-2012 "oils. General specifications" Code TN VED TS 3304 10 000 0 the serial production Meets the requirements of TR CU 009/2011 "On safety of perfumery and cosmetic products" Storage conditions and shelf life of products installed in accordance with the requirements of TR CU 009/2011 "On safety of perfumery and cosmetic products" and specified in the annexed product shipping documentation and/or on the packaging of each product unit. Shelf life 1 year. The conditions of storage not below +5 C and above +25 C. shelf Life and storage conditions indicated on the packaging. Hygiene of the oral cavity with the trademark "SIBERINA" range: toothpaste, cleansing Lemon, toothpaste cleansing "Coal"toothpaste for sensitive teeth "Daisy" toothpaste for sensitive teeth "herb" toothpaste strengthens Khvoynyy, toothpaste firming Tea tree, toothpaste firming "Basil" toothpaste refreshing Mint toothpaste is a refreshing "Eucalyptus". Is not treatment-and-prophylactic and specialized means. Trademark "SIBERINA". The contents of hydrogen peroxide and substances releasing her, less than 0.1%. Mass fraction of fluoride in terms of the molar mass of fluorine is less than 0.15%. The products are manufactured in accordance with GOST 7983-99 "Pasta dental. General technical conditions" Meets the requirements of TR CU 009/2011 "On safety of perfumery and cosmetic products" Storage conditions and shelf life of products installed in accordance with the requirements of TR CU 009/2011 "On safety of perfumery and cosmetic products".Shelf life 1 year. Meets the requirements of TR CU 009/2011 "On safety of perfumery and cosmetic products". The Declaration of compliance adopted on the basis of Protocol No. 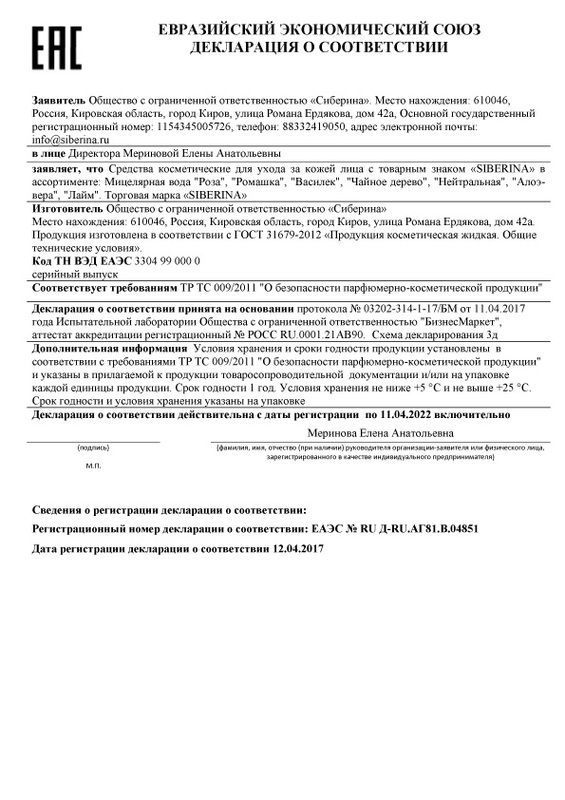 03191-314-1-17/BM from 11.04.2017 of the year Testing laboratory of limited liability company "Biznesmarket",accreditation certificate, registration number ROSS RU.0001.21AB90. The 3D scheme of the Declaration. Storage conditions and shelf life of products installed in accordance with the requirements of TR CU 009/2011 "On safety of perfumery and cosmetic products"and specified in the annexed product shipping documentation and/or on the packaging of each product unit. Shelf life 1 year.Storage conditions not lower than +5C and not higher than +25C. Shelf life and storage conditions indicated on the packaging. Cosmetic means for skin care of the face with the trademark "SIBERINA" range: Micellar water "rose", "Daisy", "cornflower", "Tea tree", "Neutral", "Aloe Vera", "lime". 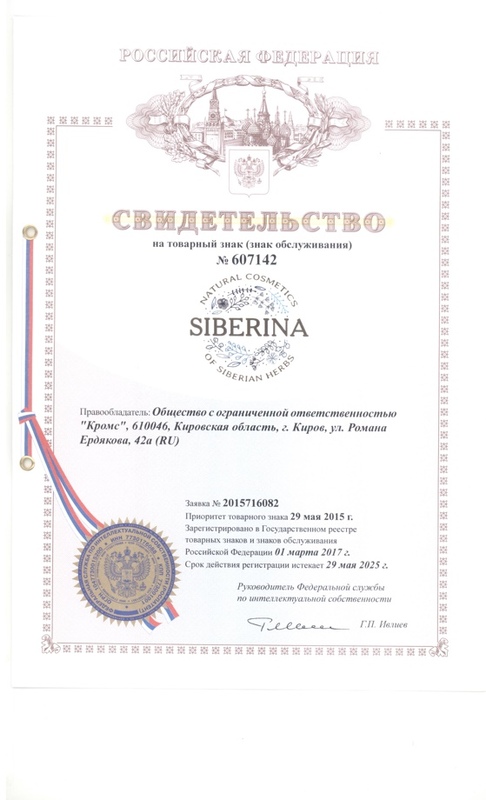 Trademark "SIBERINA" The products are manufactured in accordance with GOST 31679-2012 "Production of cosmetic liquid. General technical conditions". 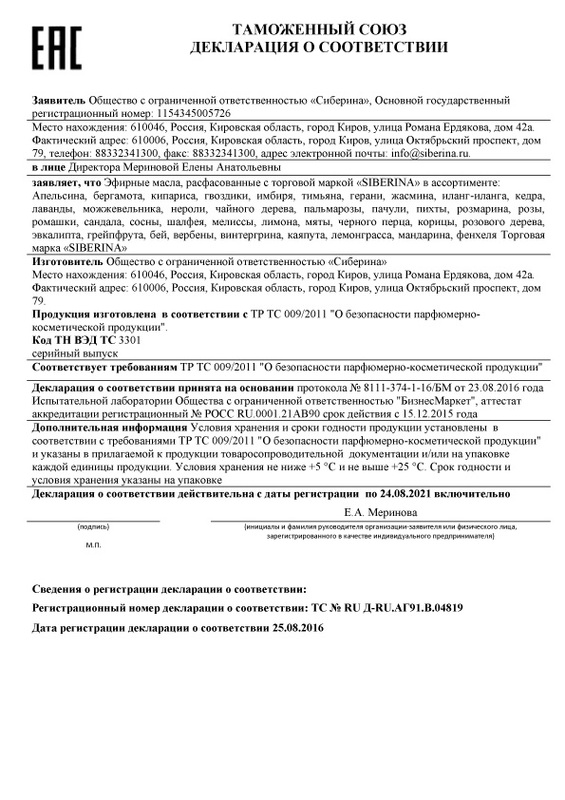 Code FEACN of the cu 3304 99 000 0 the serial production Meets the requirements of TR CU 009/2011 "On safety of perfumery and cosmetic products" The Declaration of compliance adopted on the basis of Protocol No. 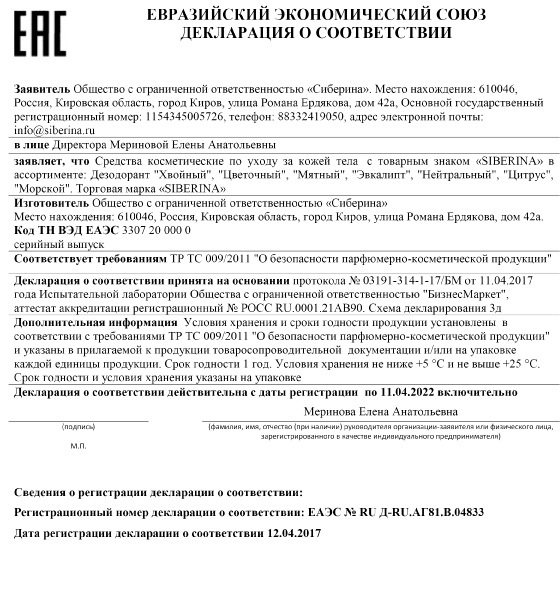 03202-314-1-17/BM from 11.04.2017 of the year Testing laboratory of limited liability company "Biznesmarket", accreditation certificate for registration ROSS RU.0001.21AB90. The 3D scheme of the Declaration. Storage conditions and shelf life of products installed in accordance with the requirements of TR CU 009/2011 "On safety of perfumery and cosmetic products"and specified in the annexed product shipping documentation and/or packaging each unit of production. Shelf life 1 year. Cosmetic means for skin care of the body with the trademark "SIBERINA" in the range: Cream body oil "rose", "Lavender", Citrus", "Sea kelp", "Siberian herb", "For sensitive skin". Is not treatment-and-prophylactic and specialized means. 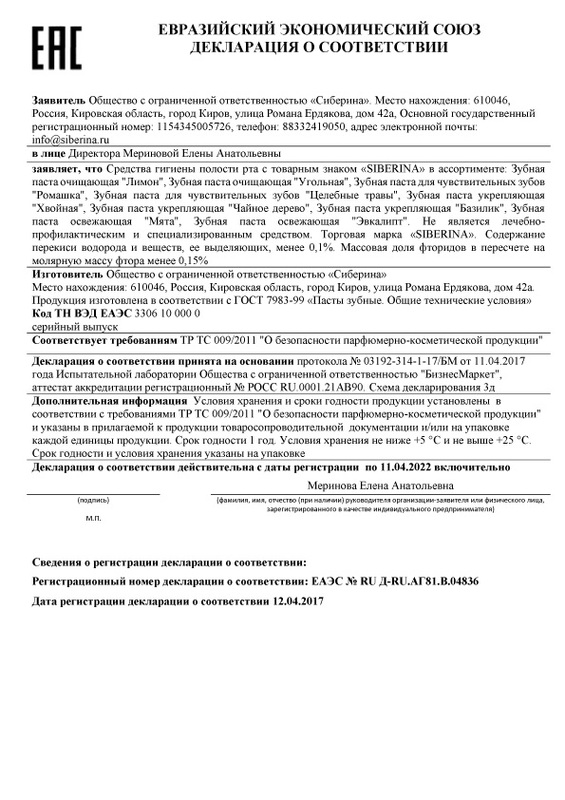 Trademark "SIBERINA" TR CU 009/2011 "On safety of perfumery and cosmetic products". of Protocol No. 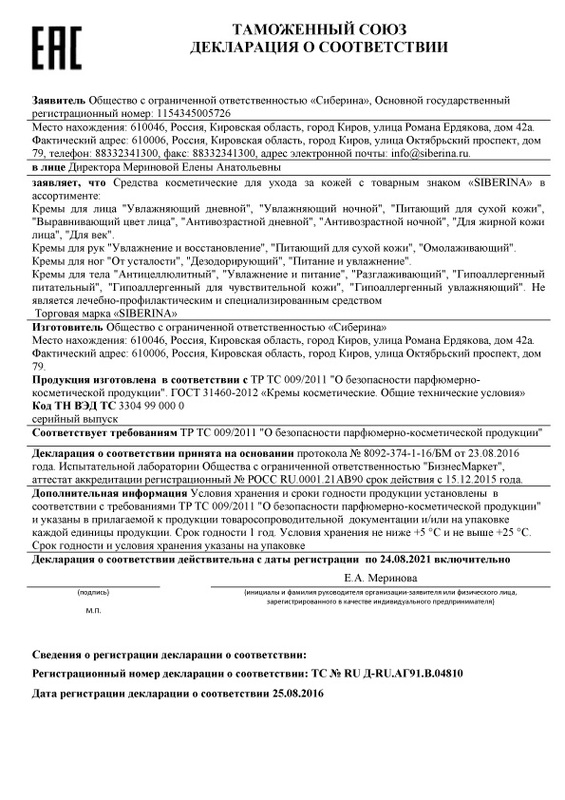 03197-314-1-17/BM from 11.04.2017 year of the Testing laboratory of limited liability company "Biznesmarket", accreditation certificate, registration number ROSS RU.0001.21AB90. The 3D scheme of the Declaration. 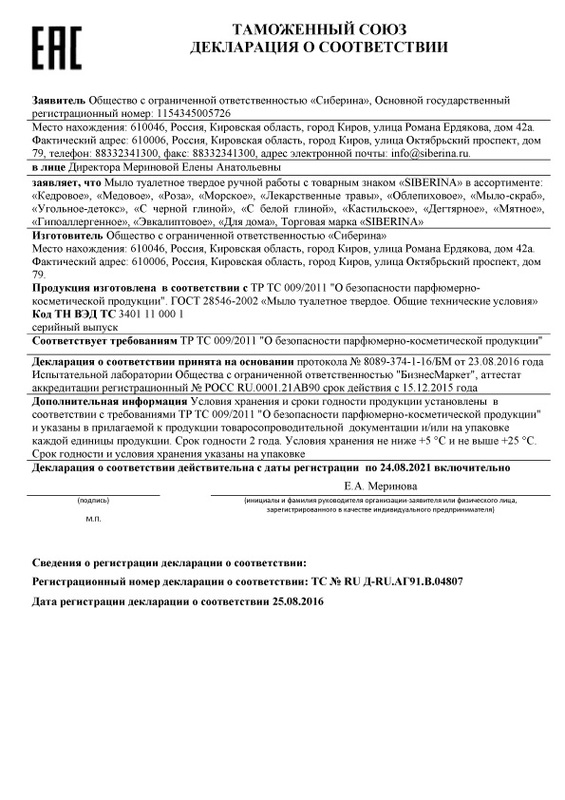 Storage conditions and shelf life of products installed in accordance with the requirements of TR CU 009/2011 "On safety of perfumery and cosmetic products" and specified in the annexed product shipping documentation and/or on the packaging of each product unit. Shelf life 1 year.Storage conditions not lower than +5C and not higher than +25C. Shelf life and storage conditions indicated on the packaging. Cosmetic means for skin care: Hydrolat floral water is packaged under the trademark "SIBERINA" in stock: Rose, mint, chamomile, cornflower, lavender, calendula, burdock, lemon balm, rosemary, pine, Clary sage, hyssop, Linden, fir, neroli, ylang-ylang, sage, hibiscus, tea tree, green tea, ginger, nettle, orange brand "SIBERINA" The products are manufactured according to CU TR 009/2011 "On safety of perfumery and cosmetic products" Code TN VED TS 3304 99 000 0 the serial production Meets the requirements of TR CU 009/2011 "On safety of perfumery and cosmetic products". Storage conditions and shelf life of products installed in accordance with the requirements of TR CU 009/2011 "On safety of perfumery and cosmetic products" and specified in the annexed product shipping documentation and/or on the packaging of each product unit. Tools cosmetic shaving with the trademark "SIBERINA" in the range: shaving Gel "sensitive skin", "Cooling", "Moisturizing" brand "SIBERINA" The products are manufactured according to CU TR 009/2011 "On safety of perfumery and cosmetic products" Code TN VED TS 3307 10 000 0 the serial production Meets the requirements of TR CU 009/2011 "On safety of perfumery and cosmetic products" Declaration of conformity was adopted on the basis of Protocol No. 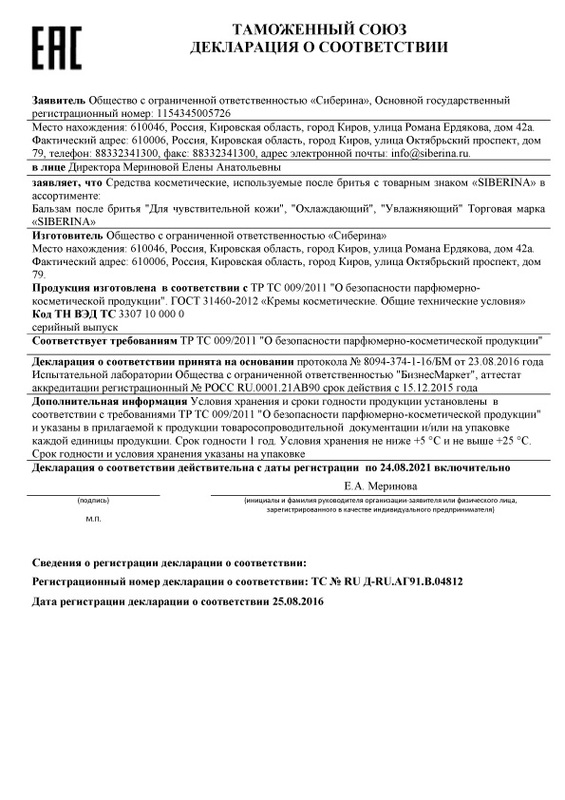 8097-374-1-16/BM from 23.08.2016 of the year Testing laboratory of limited liability company "Biznesmarket", accreditation certificate, registration number ROSS RU.0001.21AB90 valid from 15.12.2015. Storage conditions and shelf life of products installed in accordance with the requirements of TR CU 009/2011 "On safety of perfumery and cosmetic products" and specified in the annexed product shipping documentation and/or on the packaging of each product unit. Essential oil, packaged under the trademark "SIBERINA" in the range: Sage, lime, litseya cubeba, Myrtle, citronella, Basil, Manuka, Laurel, spruce, anise, hyssop, coriander seeds, moirana, TUI, pettigrain, nutmeg, myrrh, Cistus, Valerian, Vitex, pistachio mastic, cardamom, Angelica, curcuma, nayoli, immortelle. 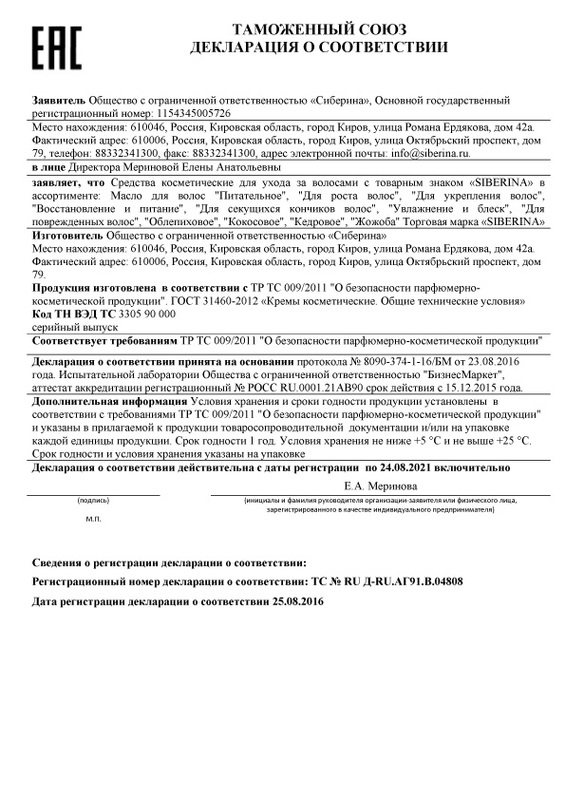 Trademark "SIBERINA" Meets the requirements of TR CU 009/2011 "On safety of perfumery and cosmetic products". The Declaration of compliance adopted on the basis of Protocol No. 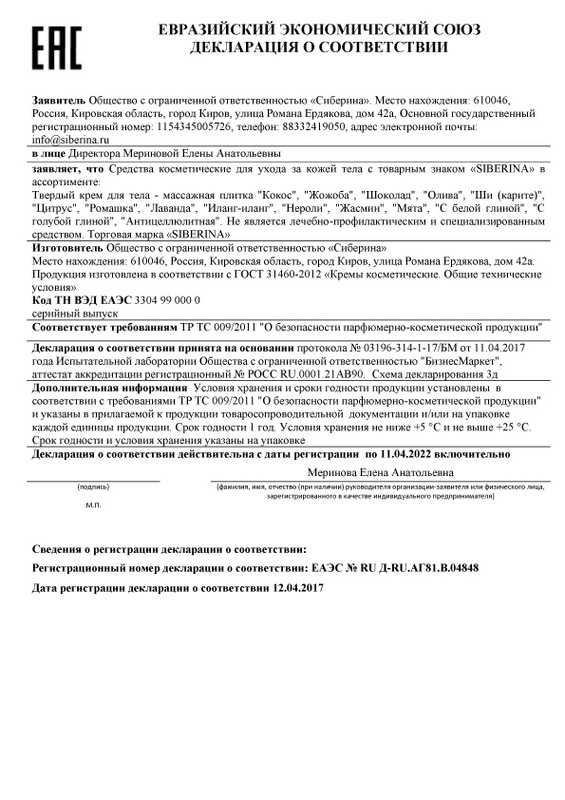 03190-314-1-17/BM from 11.04.2017 of the year Testing laboratory of limited liability company "Biznesmarket",accreditation certificate, registration number ROSS RU.0001.21AB90. The 3D scheme of the Declaration. Storage conditions and shelf life of products installed in accordance with the requirements of TR CU 009/2011 "On safety of perfumery and cosmetic products"and specified in the annexed product shipping documentation and/or on the packaging of each product unit. Shelf life 1 year.